When a man is looking to propose marriage to his girlfriend, he wants to be sure that the ring they pick out to express their love is the perfect ring. There are many different types of diamonds and settings that one can combine in order to create a piece that is both original and beautiful. Each type of setting has their positive and unique qualities. It is truly a matter of personal preference and affordability for the consumer. There are so many different choices that it is easy to create a unique ring that really speaks to the consumer and fits the style of his future bride. Engagement ring settings are broken down into two major categories: Solitaire and Three-stone settings. The type of setting can and will change depending on how many center diamonds the consumer would like on their ring. Also one needs to keep in mind the metal that they are interested in purchasing. There are three different metal types in which from can choose: yellow gold, white gold, or platinum. Depending on the metal that a consumer chooses for their ring, the price can vary on the setting. Platinum is the most expensive choice, but the most desired metal for its easy-care qualities. 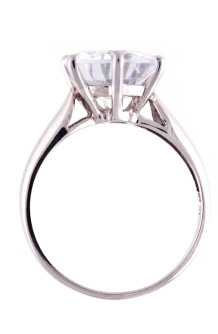 The Classic Solitaire engagement ring setting positions the center diamond high and away from the band. This allows the diamond to receive more light and gives it a little extra sparkle while wearing it. Also, since the stone sits high and away from the band, the appearance of the stone is larger than average. Consumers choose this setting often because of its wonderful price range. The cost of a Classic Solitaire setting can range anywhere from $480 to $800, depending on the quality and amount of gold or whether or not the consumer decided to go with platinum. The price has become so affordable due to its availability. This setting is available at almost every national jewelry store because of its popularity. There are two types of Cathedral Solitaire settings: Open and Closed. Both settings curve upward toward the center stone. Consumers love the romantic feel of these settings, which are supposed to resemble the ceiling of a cathedral church. The Closed Cathedral engagement ring setting offers the center diamond extra support and protection from becoming loose.These romantic settings sit the center stone far away from the rest of the setting in order to enhance their beauty and make them the true focal point of the ring. The Open Cathedral setting offers the same amount of protection and attention to the center diamond while also allowing a little bit of room in-between the raised metal and the prongs where the diamond sits. This makes room for more light to pass through the diamond and enhance the brilliance of the stone. The cost of these wonderful setting can range anywhere from $325 to upwards of $2,200, depending on the style and the extravagance involved. One of the reasons that the price can vary so greatly with these settings is whether or not the consumer chose to have diamonds in the setting. It is very popular to include pavé-set diamond in the raised metal to add a touch of elegance and brilliance to the ring. Jewelers such as Jared’s Galleria or Kay Jewelers, which are both known for selling loose diamonds in order to give the consumer the opportunity to create their own masterpiece. However, Tiffany & Co. is famous for their original Closed Cathedral setting. Tiffany & Co. has mastered their platinum and pavé-set Closed Cathedral design, however, the price runs a little higher. In order to save money, one should consider choosing their Cathedral setting from a company that carries them in great quantities. For those who are looking for an engagement ring that offers the maximum amount of protection for their diamond, the Bezel-Set Solitaire setting may be a viable option. These settings completely surround the diamond with the consumer’s metal of choice, protecting it from every angle. There are vintage-looking versions of this setting that surrounds the center stone with pavé-set diamonds instead of metal. This creates a more extravagant look and enlarges the size of the center stone. It has a recent growing popularity among those getting engaged because of its protective qualities. The cost of these types of settings can range from $400 to $800. The price tag attached also attracts consumers to this setting. Consumers want to ensure that their diamond will be safe and this setting comes at such an affordable price. With such growing popularity, more and more jewelers are carrying this style. One can find these settings at vintage or antique jewelry stores for a great price. Blue Nile Jewelers has made a valiant effort, though, to include these settings in their inventory. The Trellis Solitaire setting includes four interlocked prongs that hold the center diamond securely in place. The interlocking provides a more elegant feel to a simple design. This design can cost anywhere from around $250 to over $700 for the setting. This setting is one of the only settings that is available in a three-stone setting, as well, giving the consumer the versatility to decide will work best for both their budget and the style of the future bride. Trellis settings are now available at almost any jewelry store. This is a simple, but also elegant design that can possibly save the consumer money, in order to purchase a higher quality diamond. Over the years, purchasing Three-Stone settings for an engagement ring has becoming increasingly more popular. The reasoning behind this is mostly due to the meaning that lies behind including three center stones on an engagement ring. The three center stones are supposed to represent the couple’s journey throughout life: their past, their present, and their future. The romantic and symbolic meaning of the setting makes for a touching proposal. Depending on the type of Three-Stone setting one chooses, the price may change. The Trellis setting has become the most popular in recent year because of it’s protective and unified qualities. The Trellis Three-Stone setting may cost well over $1,000 due to the style and the size and carat weight of the diamonds that must fit into the prongs. If one chooses a more simple design, such as the Classic Three-Stone setting, which holds each stone in place with four prongs, the price may vary greatly. Classic Three-Stone settings can cost as little as $450 to up to as much as $1,000. This, again, is determined by the carat weight and size of the diamonds that must fit in-between the prongs. These types of rings can be used as anniversary rings, as well. Therefore, they are sold in many jewelry stores across the nation. They come already pre-set with diamonds, which takes away from the personalization of the ring. However, if a consumer is looking to get the most for the amount of money they are looking to spend, choosing a Three-Stone setting may be a great and stunning option for them. With so many choices, how does a man find the perfect ring for his future bride, knowing that she will love it? There are several factors to consider before even looking at settings. In order to get an idea of what type of jewelry setting she would be interested in one should take cues from the jewelry that she already has. If it has a more vintage-feel to it, she may like the Bezel-Set rings best. If her necklaces stand out, she may like a Cathedral setting. These are things that one can discuss with their jewelry specialist while looking at rings. If she has any right-hand rings that she constantly wears, take cues from the style of those rings, as well. Keep in mind, though, as long as it comes from the heart, she will love it because of what it symbolizes. The biggest mistake that is made before proposing is not checking for her ring size. If the proposal is a complete surprise, the easiest way to do this is take one of her other rings to the jeweler and have them create an accurate sizing from that piece. If she is aware the proposal is coming, then take her to the jeweler and have her ring finger sized. It is the easiest and most efficient way to avoid having an awkward and embarrassing moment during the proposal. A wedding proposal is one of the most special days in a woman’s life. There are many choices to make before the actual day comes and many ways that a man can show his future wife how much he loves her. Above all, though, choosing the perfect engagement ring is the most important decision. This is an item of jewelry that she will treasure for the rest of her life. One must be sure to take into account of all the selections that are available and choose what would best fit his bride’s taste and his budget.